Honda says its 2013 Fit EV has received the highest fuel efficiency rating ever from the Environmental Protection Agency. The Japanese automaker says the subcompact electric car received a combined adjusted mile-per-gallon-equivalency rating of 118 mpg. The Fit consumes 29 kilowatt hours of electricity per 100 miles and has an EPA rated annual fuel cost of $500. With such an efficient drivetrain, the Fit EV's 20-kWh lithium-ion (Li-ion) battery provides the capacity to earn an EPA combined city/highway estimated driving range rating of 82-miles, allowing the Fit EV to surpass the EPA efficiency and range ratings of the Ford Focus Electric (105 MPGe, 76-mile range), Nissan Leaf (99 MPGe, 73-mile range), and Mitsubishi i-MiEV (112 MPGe, 62-mile range). The Fit EV's exceptionally efficient design – encompassing everything from savvy powertrain design, weight-conscious engineering and effective aerodynamics – makes the most of the Fit EV's smaller battery. Additionally, the Fit EV battery can be recharged in less than 3 hours from a low charge indicator illumination point when connected to a 240-volt circuit. The Fit EV's 92 kilowatt (123 horsepower) coaxial electric motor generates 189 ft-lb of torque, and is teamed to a chassis with a fully-independent suspension and a driver-selectable 3-mode electric drive system adapted from the CR-Z Sport Hybrid. 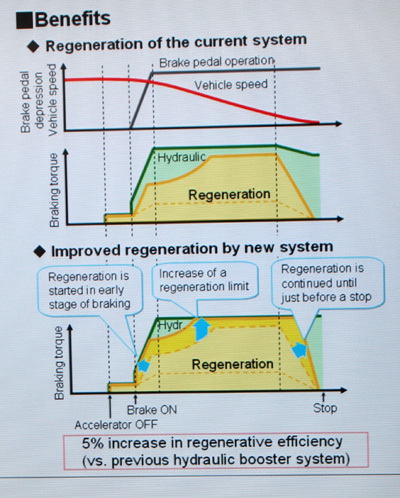 The key to maximizing energy efficiency is Honda’s new regenerative braking system. The Fit EV features an electric braking system that uses an electric motor to directly drive the pump that serves the brake fluid. When you take your foot off the accelerator, you immediately have a little bit of regenerative braking. Then, you put your foot on the brake—and if you look at the curve on the hydraulic system, it goes up very sharply. But if you look at the yellow zone in the graph, [in the old system] the regeneration doesn’t go up as sharply and it’s delayed. The idea of the new system is to bring the regenerative yellow zone closer to the hydraulic response. The first part of the slope is very similar to the hydraulic. Then, as you start reaching the regeneration limit, the slope gradually slows down a little and reaches the limit after what the hydraulic system can do. After that, you can keep regeneration system at the highest level longer than the current system. And just before you stop, the drop is even sharper than the old regeneration system.